Cyprus is not known as one of the dive locations in the world. However, most divers do know that one of the world's best scuba wreck dives is located just offshore Larnaca. 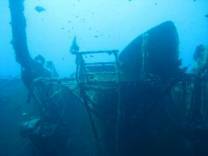 The Zenobia is a large in coral encrusted wreck which sank in 1980 at its maiden voyage because of technical failures. Right into the Mediterranean Sea it is of course a beauty of a dive region. Water temperatures of 18 degrees are normal in winter while the temperature can increase up to 27 in summer. Land temperatures can easily be ten degrees more. A thin wetsuit or lycra suit will be enough in the warm months from April to August while some prefer thicker wetsuits or even dry suits in winter. There are many caves, tunnels, wrecks and a very healthy coral line just off shore most of the districts. Dive sites are often just a few minutes away by boat and have excellent visibilities. The crossing line between Turkish Cyprus and Greek Cyprus is administered by a long and wide United Nations buffer zone. It was Turkey who used excessive violence and occupied the north part of the island in 1974. They sent over two hundred thousands refugees from their homes. Up till today, it is only Turkey who officially recognizes the Turkish part of Cyprus as a country of its own. Its capital Nicosia, half in Turks Cyprus and half in Greek Cyprus, is one of the best remained historical cities of Cyprus. Touristy spots such as Petra tou Romiou (the Rock of Aphrodite), Troodos Mountains, Paphos Castle, spectacular Byzantine churches, ancient Greek and Roman ruins are worth coming to Cyprus for. Its beautiful towns are boasting with life, bars, restaurants and other forms of entertainment. Cyprus golf holidays are very popular. Cyprus is therefore a brilliant destination to combine diving with other forms of tourist holidays. There are many dive shops all over the island which make it easy to start an open water course or to simply book a two dives boat tour. 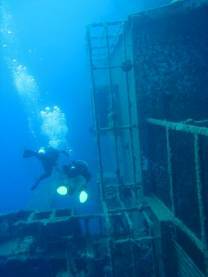 Nowadays, it is not only the Zenobia you can dive at but diving has become popular all across the island. As well as the Greek and Turkish districts offer spectacular diving, one being even better and more remote than the other. Because of their internal disagreements it is however not very easy to cross into each others lands. Resorts in the south of Cyprus are more famous, developed and touristy than in the northern Turkish parts of Cyprus, but some pristine diving can be done there as well. Artefacts such as pottery and coins are often found at the seabed but know that taking them with you is strictly forbidden by local law. Larnaca is separated in a small Turkish part and a larger Greek part in the south. Built on the ancient city of Kition it is full of ancient and historic excavations. The old capital of Paphos is overlooking the harbour and filled with bars, hotels and restaurants. The Akamas Peninsula in the upper northwest attracts many divers. Kyrenia is an upcoming tourist destination especially for Turkish tourists. In the south of Farmagusta lays the once quiet fishing village Aiya Napa. This small town has developed into Cyprus best rated destinations with clubs open 24 hours a day, brilliant beaches and all the activities you can wish for.